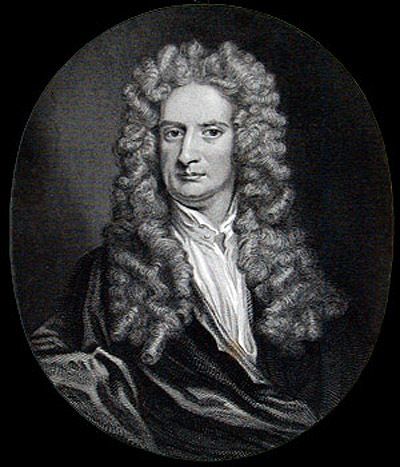 Sir Isaac Newton was a brilliant man whose contribution to science and mathematics cannot be overestimated. He may have contributed more to the development of science than anyone else in human history. This is pretty high praise, but well deserved. I am, however, not overly impressed with his choice of hairstyle! First Law: Every object continues in its state of rest, or of uniform motion in a straight line unless compelled to change that state by external forces acted upon it. Second law: The acceleration (a) of a body is parallel and directly proportional to the net force (F) acting on the body, is in the direction of the net force, and is inversely proportional to the mass (m) of the body. To simplify, things that are sitting still don’t move unless something pushes them, pulls them, or in some other way compels them by force. This is true for toy trains, monster trucks, and even planets. See, I told you he was a pretty smart guy! These laws are also true for you and me. We have a tendency to stay where we are unless someone, some group, or something compels us in some way to move. It may be love. It may be compassion. It may be greed. It may be pain. A body in motion tends to stay in motion. Is that you? Is it God’s will for your life? What things move you? Are they healthy or unhealthy? How do you influence others to move? Is that healthy or unhealthy? As we draw to the close of another year (and I am making the confidence assumption that we’ll all be here are December 21! ), it is a good time to ask ourselves some serious questions about where we are, where we’re going, and where God is calling us to be.